4 Responses to Why do so many states allow (i.e. tolerate) animal torture and killing? Animals are feeling, living creatures. They should be treated with respect. Someone that can torture a poor defenseless animal, could just as easliy do the same to a human being. The laws need to be harsher. Steve King thinks animals have no value. He is an evil, insane, little man. What a terrible world we live in !! Thanks so much, Kristina; you are exactly right. 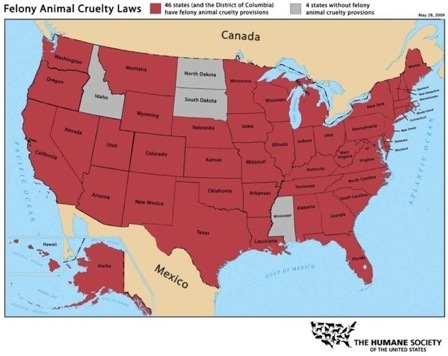 And, until the laws get changed, people will continue to torture and inflict cruelty on pets and other defenseless animals. You’re not the first to note Steve King’s “mental instability.” It’s still so hard to believe we have man in congress who doesn’t even know how to separate issues. (Then again, he does have nothing more than a high school diploma.) Abortion is one issue; animal torture and cruelty is quite another. Unfortunately, too many Iowa voters check the box next to his name because it somehow makes them feel “intelligent” for actually having recognized a candidate’s name. Oh….the irony! At least we do have a terrific candidate running against him in this year’s election. Matt Campbell is highly qualified and could bring much needed representation to a district that’s been without it for years. Thanks again for writing! As you can see these people abuse you down for no apparent reason and its not fair cuz the government the major the president could of done something but they did nothing and they need to take care of the animals they may not be the same they may not look the same but their souls are.